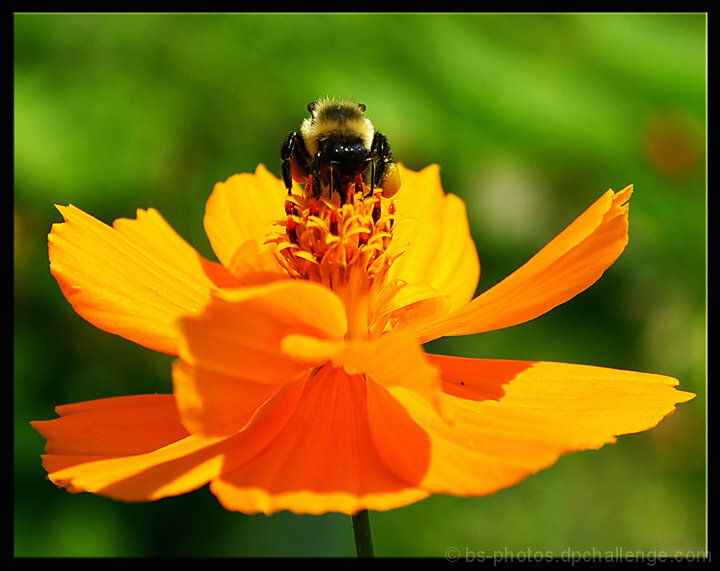 First Impression: A nice sharp colourful shot of a Bee on a flower with a nice green background. Composition: The central composition works fine here, the flower fille the frame well and the Bee adds that bit of interest. Totally square with more of the background at the top might have helped the overal composition for me. Subject: At dpc this type of shot is quite common and to really stand out it has to be perfect. Nice colours on the flower and an excellent background help this image and think the 5.2 vote was mainly because there is nothing new here. You should definately have cloned out that spot on the right hand petal and whilst you were probably following Bees round the garden it might have paid off to have removed the front two out of focus petals and waited (and waited) for the Bee to come to you. This would have made the image much better imho. Technical: A decent exposure, the colours really pop and the focus is spot on where it should be. Final thoughts: Not a fan of the border and it is stopping me from viewing the image as I'd like to. Overall a well taken shot and for what its worth it should have scored a few tenths higher imho. Proudly hosted by Sargasso Networks. Current Server Time: 04/22/2019 11:59:51 AM EDT.